To Buy or Not To Buy Talent? 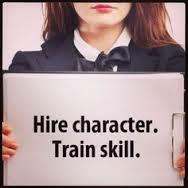 Do you have the right talent with the necessary skills? Do you have the specific talents to take on certain role(s)? Can you accept lower productivity out of the gate? Can you afford to train someone? To buy or to build is the REAL question. Your decision will impact your financial performance. Appointing people internally reduces your turnover rate. When your employees are engaged, they work on improving the environment around them. They embody creative energy and create contagious energy. They seek challenges and find solutions. Research has shown that engaged employees contribute to increase your financial performance. To develop a culture focused on building internal talent, you need to make talent a strategic priority. You need to spend more time on developing your employees. Go beyond the baseline conversation about goals. Ask your employees what they want to accomplish and what they feel their opportunities for improvement are. When someone completes an assignment, celebrate both the outcome and the learning, especially if the assignment wasn’t completed as smoothly as everyone would’ve liked. What if you can’t afford to train someone? You might have to consider buying “strategic” talent in order to fill the gap faster. How long will you be able to retain that talent? Be prepared: your competition might be buying that same talent from you! Your best option is to build talent. The aim is to create a pipeline of talent so that your business always has the skilled and experienced people it needs. Start now. In the end, of course, getting the right person for the job is the priority and sometimes that might mean having to look externally. You need to be clear about the significant benefits of drawing on internal talent. Don`t lose sight of the impact on your bottom-line results.